In these lessons, students will engage with the themes and ideas at the heart of the text, including the supernatural, power and loyalty. Tasks include: tracking recurring themes throughout the text; a close reading of the witches and apparitions in Act 4, Scene 1; and a card game which will help connect themes to characters and the text. Can I list some of the key themes of Macbeth? Display a montage of images connected to the plot of Macbeth. This is available in the Props PowerPoint in the Downloads section of this resource. Students should first of all identify as many items as they can from the montage (e.g. dagger), and secondly pick out as many ideas, themes and issues as they can that are suggested by the images in the montage (e.g. power, death, violence, war). Students are given pieces of paper which represent plaques for statues. They should write down the key themes of the play on these plaques, e.g. power, ambition, family, trust, fate, loyalty, unity, etc. Students work in pairs or threes to sculpt themselves into poses representing statues for the Scottish king’s castle. Which statues would Duncan choose for his castle? Which ones would Macbeth choose? What about Malcolm? As an extension activity, students could embellish the plaques by having an appropriate quotation from the play engraved onto each plaque. There is a page to create some theme ‘plaques’ in the Student Booklet. A theme can be defined as a recurring idea within a work of literature or other work of art. It could even be described as an idea that ‘haunts’ a work of literature, particularly if the theme is a rather sinister and eerie one! 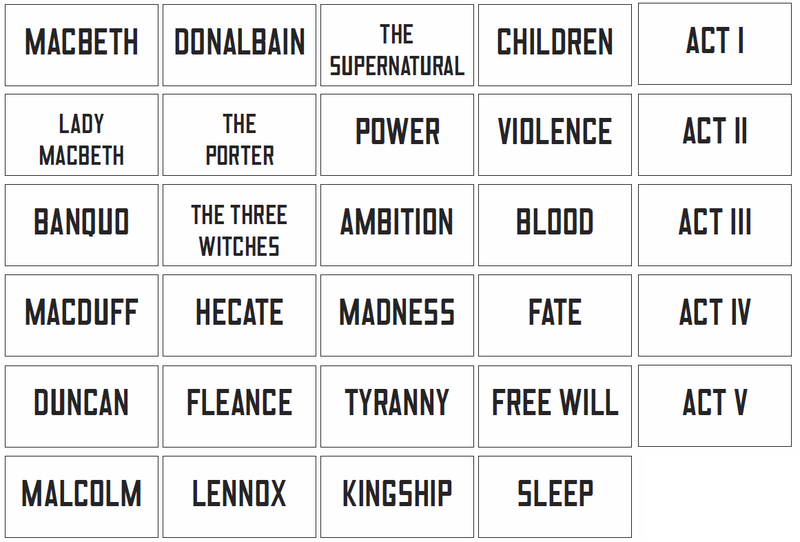 In groups, students could be assigned a macabre theme from Macbeth: violence, the supernatural, evil or madness. They should then identify at least three occasions when that theme makes its presence felt in the text. How and why does Shakespeare do this? One or two groups could be asked to track more positive themes to look at how Shakespeare sows the seeds of a more hopeful resolution to the play, particularly through the figure of Macduff: e.g. goodness, healing, heroism, unity. What would I say are the main themes in the Macbeth? Ask students to write a spell that lists the main themes from the play, using the witches’ spell from Act 4 Scene 1 as a model. Students can play around with icons representing important themes from the play in this Clan Badge Maker: 2011.playingshakespeare.org/node/98. Each of the themes mentioned in this learning sequence has a dedicated lesson within these materials. In depth activities linked to ‘Trust and Betrayal’ and ‘The Supernatural’ follow here in the Key Stage 3 section. Look in the Key Stage 4 materials for sections about ‘Appearance and Reality’, ‘Power and Ambition’, ‘Family and Succession’ and ‘Guilt and Conscience’ and for detailed guidance on writing about themes. 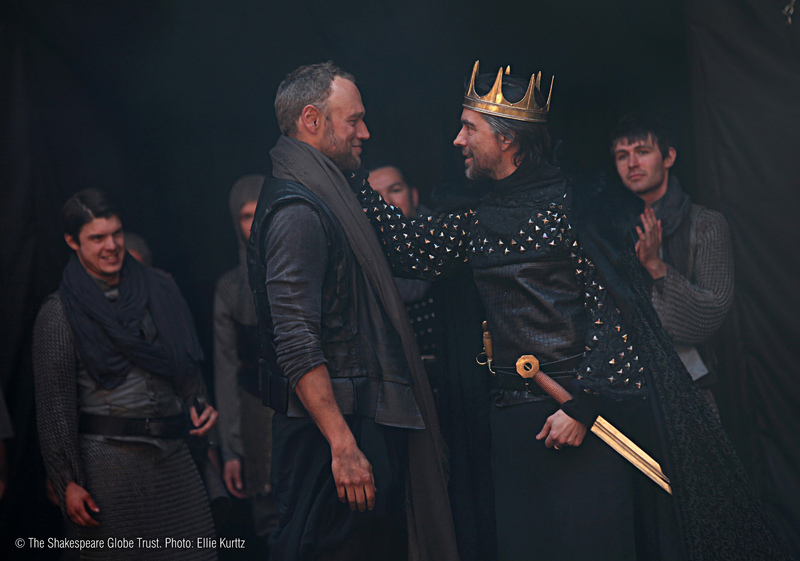 Can I investigate how Shakespeare explores the themes of trust and betrayal in Macbeth? Can I explain how and why Macbeth goes from being a loyal subject to a murderous traitor? Friendly Follower: A pair of students each has a turn of one leading the other around the room holding hands. The follower must have their eyes closed and the leader must ensure the follower is safe and doesn’t bump into things. Repeat, but this time the contact is reduced to fingertip to fingertip. Repeat for a third time with only the sound of the leader’s voice guiding the follower. Falling Trees: One student stands in the middle of a tight circle of 6 to 8 students with no gaps. The students in the circle put their hands up, palms facing out and the student in the centre should have their arms up against their chest and their eyes closed. The student in the middle should gently start to lean and ‘fall’ like a falling tree. The group supports and protects the falling student, gently pushing them back and forth. Take it in turns to be the ‘falling tree’. For this activity, students will be closely reading and analysing two scenes from Act 1, in which trust and betrayal are established as important themes in the play. Model a close analysis of Act 1 Scene 2. Students could work more independently in groups looking for textual evidence in Act 1 Scene 4, and then collect their evidence in the ‘notebook’ in their Student Booklet. Q) Who does Duncan trust? How do we know? Q) Who doesn’t Duncan trust? How do we know? Does Macbeth trust anyone in the play? How trusting is the relationship between Macbeth and Lady Macbeth? What part do trust and betrayal play in the relationships between different characters in Macbeth? Create a colourful, illustrated mindmap with the words ‘trust/betrayal’ in the middle. Reflect the importance of these themes in the play in terms of characters, their situations, relationships and their motivations. Students could write an account of their experiences of the trust games in the Rehearsal Diary pages of the Student Booklet. They should give examples of how these insights could be reflected in the way a certain character might be played, or how a certain scene might be staged. 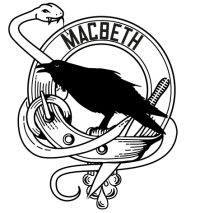 Can I identify why Macbeth has a reputation for being a dark and unsettling play? How might modern and Jacobean audiences react to the supernatural elements in the play? Write down what they think the connection is between all of the words. connections to other stories, films, poems, news stories, etc. Given the topic of the lesson, students can go to town making their word webs look spidery! Take feedback on each word. Read the handout ‘The curse of Macbeth’ in the Student Booklet, taken from Ben Crystal’s book Shakespeare on Toast. 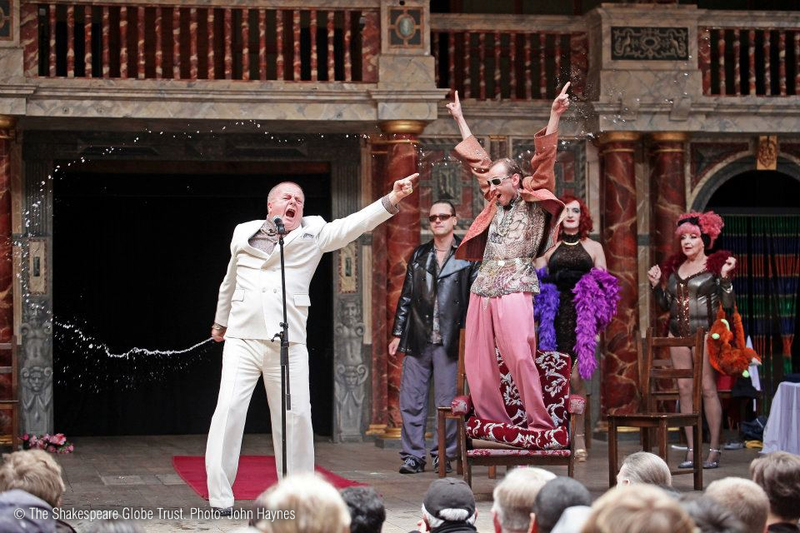 Students should answer the quick information retrieval questions and then come up with a list of reasons why, in Crystal’s words, ‘Macbeth seems to cause a certain amount of trepidation.’ Finally an extension question asks students to consider why the play might have caused a great deal of trepidation on the part of audiences as well as players when it was staged. Students could try to include some of the vocabulary from the starter activity. This question, requiring some research, would work well as a homework task. 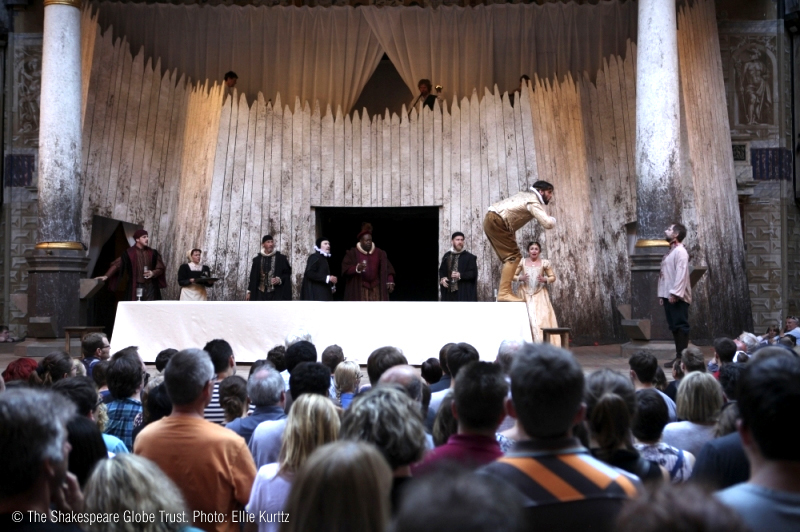 As an introduction to this task, students could look closely at three images from past productions of the banquet scene in Macbeth at the Globe. They should comment on some of the different staging decisions and give evidence. These can be shown to students using the The Table’s Full PowerPoint (available in the Downloads section at the bottom of this page). Taking all of this analysis into consideration, ask students whether they think that Macbeth’s vision of Banquo has a supernatural explanation. Is Banquo really haunting Macbeth? How else might we interpret his appearance? There is plenty of scope in Act 4 Scene 1 for spectacle when Macbeth returns to the witches. Macbeth demands answers and what follows in the script opens up a wealth of opportunities in terms of drama and design. Students should read lines 68-133 from the Student Booklet as a class or in groups, with one student reading the stage directions. Students can briefly discuss ideas about staging this section of the scene and the effect they want it to have on the audience. Beware the Thane of Fife. – Dismiss me. – Enough. Macbeth: Had I three ears, I’d hear thee. Macbeth: Then live, Macduff: what need I fear of thee? All: Listen, but speak not to’t. Why sinks this cauldron? and what noise is this? Macbeth: Thou art too like the spirit of Banquo: down! A third is like the former: - filthy hags! Why do you show me this? – A fourth? – Start, eyes! What! will the line stretch out to th’ crack of doom? That two-fold balls and treble sceptres carry. And points at them for his. – What! is this so? And show the best of our delights. Students can draw on interests in drawing, collage, photography, dance, etc. to develop their personal response to this task, which can be completed in the Student Booklet. 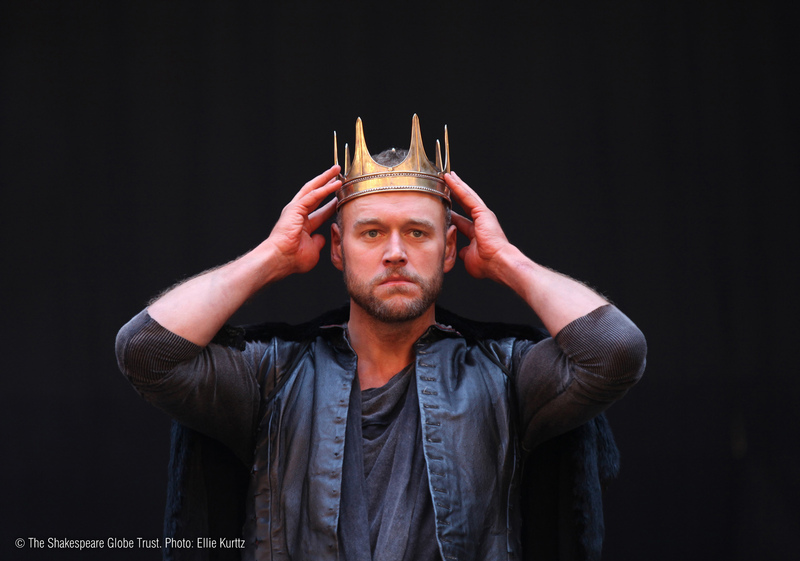 Do you agree that Macbeth is a play about supernatural forces? How do you think the average modern audience reacts to the supernatural elements in the play? Allocate to pairs of students different words that could be used to explain the events in the play, e.g. magic, fate, evil, greed, ambition, love, grief, jealousy, temptation, insecurity, etc. Ask students to share a sentence or two with a strong argument for their explanation. Students might enjoy watching the Blackadder episode (‘Sense and Senility’ from Series 3) in which Edmund teases the actors by repeatedly mentioning ‘The Scottish Play’! You will find suitable further materials within the Key Stage 4 materials to develop an understanding of this theme in the play. One of the lessons under Language explores the otherworldly qualities of the witches’ language. 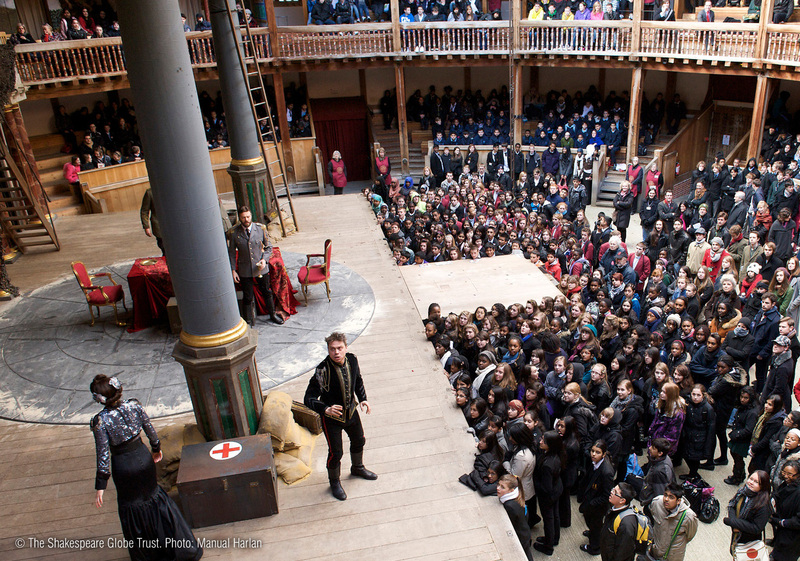 One of the lessons under Historical and Social Context supports students’ knowledge and understanding about how witchcraft was viewed in Shakespeare’s time.